The Axtell condominiums are located at the Crested Butte Mountain Resort base area, directly across from the Silver Queen chairlift. The address is 12 Snowmass Road, Mount Crested Butte, CO 81225. Buckle up your boots in the warmth of your condo, head outside, walk a few steps, and load the lift for a day of skiing. It’s hard to get much closer to a ski lift than this! Not up for a day of skiing?- the restaurants and shops of Mount Crested Butte are right outside your door. Also nearby, the town shuttle bus stop at the transit center runs every 15 minutes during the winter, and 20 minutes in the summer. Speaking of summer, there is lots to do at the base area during the warmer months as well, including hiking and biking at the ski area, plus free weekly music during the summer. 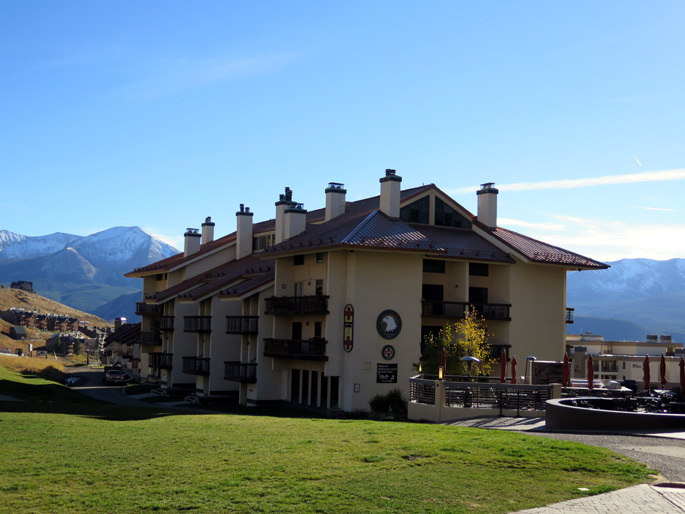 Technically known as the Village Center Condos- Axtell building, these units make great rentals since they are truly ski-in/ ski-out. The dues are reasonable and include use of the hot tub and parking right there at the base area. As of 5/7/2018, there were 2 sales in the past 24 months, with an average sales price of $301,000. If you are interested in buying or selling a condominium at the Village Center- Axtell building, feel free to contact me anytime. Overview, map, information, plus all Axtel condos for sale in Mount Crested Butte, CO. Request a property valuation for your Axtel condo.